Looking for new ways to add movement to your lessons? Relay races is an easy way to add movement and review skills. You can use this activity for phonics or adapt it for math or other subjects. 1. Divide your students into groups. If they are particular wiggly the day you decide to do this, you need to have more groups so they will run more often. 2. Students line up in straight lines behind a line. 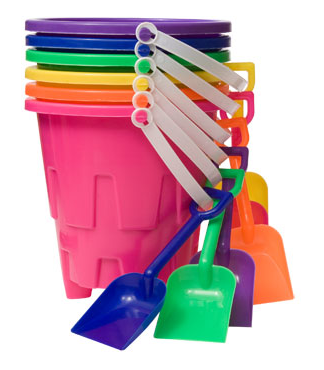 Beside each team is a different colored bucket. Each team is assigned a bucket. Dollar Tree has these buckets for $1. 4. The teacher will give clues for what letters the people at the beginning of the line needs to find in the hula hoop. After giving the clue, the teacher will say “go”, the student will run to the hula hoop, find the correct letter, and put it in their bucket. 5. The winner is decided at the end. The team or teams that have all the correct letters in their bucket is/are the winners. Use a variety of letters like the ones in the picture above, so your students will practice identifying letters with different fonts. Clue #1: This letter is the sound you hear at the end of the word “globe”. Clue #2: These are the letters you hear at the beginning of the word “chain”. Clue #3: These are the 3 letters you hear at the end of the word “coming”. Clue #4: This is the sound you hear in the middle of the word “zap”. Find a shape that is a compound word. Find a shape that has a digraph at the end of the word. Find a shape that rhymes with dish. You can also make this game into a Math Relay Race game. It can be adapted to any grade level. Clue #2: What is the answer: How many sides does an octagon have? Clue #4: What is the answer: How many minutes are in a quarter hour? This game burns off excess energy while reviewing skills your students have studied. It’s a WIN-WIN! Thank you for the wonderful ideas! I've pinned them too!